Passengers are welcome to board our ship at 6:00 p.m. After comfortably settling into your cabins, we'll introduce our crew at a welcome cocktail. The evening is yours to do as you please. Join us on an excursion for both packages: Guided tour of Córdoba and its Mosque-Cathedral. CLASSIC: Tour of Seville and discovery of the Alcazar and the cathedral. DISCOVERY: Guided bike tour of Seville passing the most beautiful monuments of the city. Tour of the Alcazar, among the oldest royal palaces in Europe. The afternoon will be spent sailing. Tonight, join us for an excursion for both packages: Flamenco evening. This morning, take part in an excursion for both packages: Jerez and visit to a "ganadería". CLASSIC: Cádiz and its cathedral. DISCOVERY: Hike along the oceanfront in Cadiz to the Castle of San Sebastián, followed by a tasting of local products. We'll cruise along the Guadiana towards Alcoutim. Enjoy time at leisure to discover Alcoutim. We'll return on board and depart towards Vila Real de San Antonio. Join us on an excursion for both packages: Guided tour of Faro, capital city of the Algarve, and Tavira, with its contrasting mixture of former fishing village and middle-class housing. Enjoy an evening of Fado entertainment on board. We'll start cruising in the evening towards El Puerto de Santa Maria. Our ship will cruise through the night. CLASSIC: Tour of the Osborne cellar and tasting of local wines*. DISCOVERY: Hike in Sanlucar de Barrameda through then Doñana National Park, one of the largest biosphere reserves in Europe. 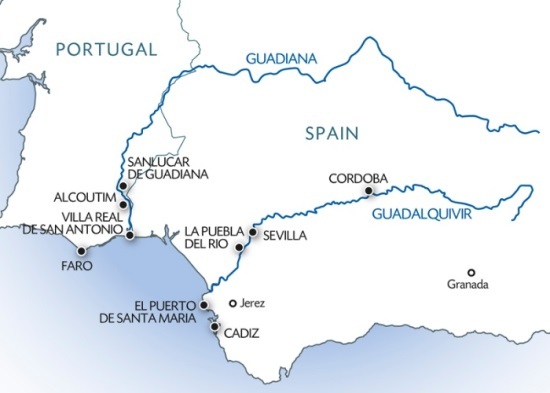 This afternoon, we'll cruise to Isla Minima, passing the Doñana National Park, designated by UNESCO as a World Heritage Site and a Biosphere Reserve, and the city of Sanlucar de Barrameda. We'll tour a genuine Andalusian hacienda located on the banks of the Guadalquivir followed by an equestrian show. Afterwards, we'll return on board and start cruising towards Seville. Enjoy an evening of entertainment. Our ship will cruise through the night. Join us on an excursion for both packages : full-day excursion to Granada. This grandiose and verdant site owes its prestige to its Moorish monuments, especially the Alhambra: a palace straight out of the 1001 Nights and to the Generalife, a pleasure palace with attached romantic gardens. We'll return on board after our tour for our gala evening and dinner.